I received some emails from people who wanted a version of the graphic novella with an English translation. They were former Latin learners who wanted a quick way to check their reading in Latin. So I did. It is sold on Amazon here and is hopefully identifiable by the fact that it has a white sticker in the corner "With English Translation. " I laid out the translation in comic format so it would be easy to find the line the reader wanted to check. (See example below.) The English translation version contains the same color graphics in Latin as the one without as well as all the introductions. It does NOT contain a Latin-English glossary. Unfortunately, the cost of color printing made that cost prohibitive. While less useful to Latin teachers, it may be a good gift for your friends who still read Latin occasionally. One of the most engaging and instructive activities that can be done with these stories (and others) is to have students act them out. To do this, you need to break the students into small groups, assign them each a scene from one of the stories and have them transcribe the scene as a play. As each story is nearly all dialogue, this shouldn't be difficult. (The Teacher's Resource Guide still in process) will contain the stories in dramatic format to make this task easier. Since most of the scenes contain only 2-4 characters, you might also want to appoint a director and a sound affect manager to each group. The director is responsible to write in stage directions as well as emotions to the lines. The sound affect manager should create sounds affects physically or from a computer and play them at the appropriate time during the performance. These roles are also useful to create participation for students who are reluctant to perform. If your school has the resources, the students can also film the scene as a movie or an audio story. (Tunica Rubra since it contains scenes in several different locations might work well in either of these two formats) Give the students several periods to practice and then have them perform the story. ​ Whenever I have asked students to act out a story that we have read, my initial reaction is to doubt my sanity when confronted with the din created by 5 groups of students simultaneously practicing their scenes. After the assessment, however, I always feel vindicated since students consistently demonstrate that they have acquired a great deal of the material. Another creative activity to do after reading, is the have students write additional scenes for the text. This will especially engaging for your advanced students. Students can create these scenes comic book style either by drawing them or by using one of many comic creation kits on-line. I recommend Storyboard That. It is the easiest comic creation that I have found and has many different historical settings and people. Necare Mortem: - The three friends discover that they are "dead." What conversation would they have with each other with death whom they can finally see and meet? Colonel Morris alludes to the fact that another man wished on the paw with the result that his last wish was "for death." What did this first person wish for and what exactly happened to him? Cornelia Rufini reveals to Antonia that Lucius killed his brother. What exactly happened? Write the scene where the murder took place. Note: For additional reading practice, the Teacher's Resource Guide contains some new scenes as well - none of which have been described here. If your students are 1:1 - you probably have discovered Quizlet. If you haven't - you really should. It's a site where you can create FREE virtual flashcards for practice. You can also search and use other people's. Quizlet has also recently added a bunch of new games including the highly entertaining Quizlet Live. I uploaded a folder to Quizlet that has practice with words and phrases from the stories- copy them to your own account and then edit as suits your own needs. If your students aren't 1:1 - you can print these phrases and use them for games in the "How to Tackle the Vocab" blog. Don't be intimidated - this book only looks like a comic book. Like more serious looking texts, this book can be used to increase students knowledge and acquisition of Latin. My advice would be to teach each story singly rather than tackle all three at once. Below is a road map of how to use this book as a teaching tool. Part I: Review the Grammar. Students reading the story should have prior experience with most of the grammar that is used. See the list of grammar in the beginning of each story for a more detailed list. Most important is the use of verb tenses and pronouns See the Grammar In the Stories post for more info about these. They need not be experts but students should have done some work with pronouns and active indicative verb tenses before they begin. This book will give them greater practice and fluency in reading verb tenses and pronouns in context. Part II: Learn the Vocabulary. Students should know most of the vocabulary prior to reading the story. Refer to the vocabulary lists to see which words your students know and which ones they don't. Prepare to teach the ones your students don't know before they read. Lists are in the Omnia drive or just click here. Different activities to pre-teach the vocabulary can be found in the Vocabulary in the Story blog - along the right hand side of the page. Or you can click here. Part III: Use one of the Movie Talks to further aid acquisition of some of the sets of words. Part IV: Read the story At this point, some people may be wondering - what should we do while they read- Summarize episodes? Answer comprehension questions? My advice would be to just let them read the story. Having taught English for many years, I can tell you definitively that these kinds exercises tend to ruin a student's enjoyment of a book. Their main function is to provide oversight so that the students actually read the story rather than nap at their desks. In fact, my experience that even with such oversight, if the book truly stinks - they won't read it anyway. I like to group the students into 3 and have them each pick a character to read. You can have them read the lines in Latin and then go back and read it again, saying their character's lines in English. Of course other group members can help if they get stuck. My 8th graders read the first story in 45 minutes. Part V: After the Story. Clarify, Create, Discuss, Retell, Act out - Once the story has been read, now is a great opportunity to do a number of post- reading activities to make sure that the Latin is acquired. Students may have some questions about life, love, death and curses as well. Movie talks are a wonderful vehicle to give student practice with vocabulary and phrases. The practice was created by Dr, Ashley Hastings and is described on many different teaching blogs. The trick is to find a short movie that uses vocabulary you intend to teach - describe the plot of the movie in Latin either before, after or during the movie, thus aiding acquisition of the words. Below are three short movies that will work with the stories. First up is a great little film called "Death Sails." 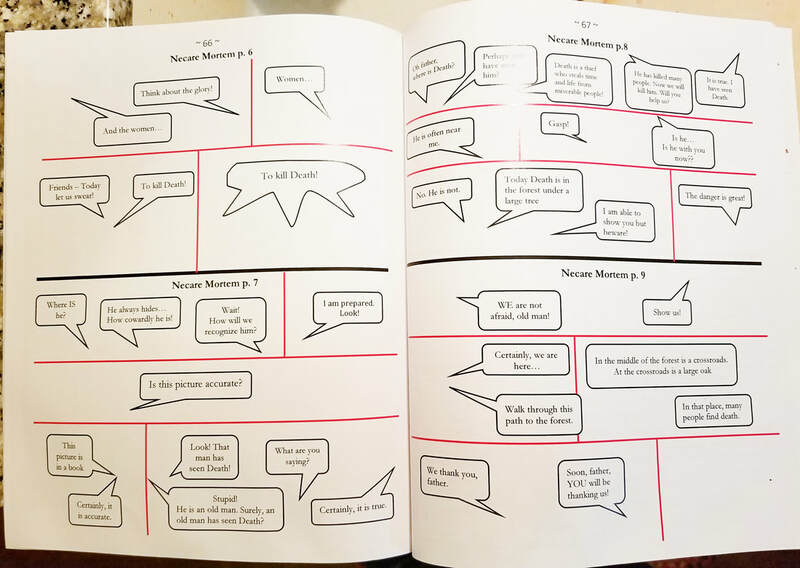 It works well to introduce many of the phrases and words in Necare Mortem as well as the idea of Death as a character, which may be new to your students. You will need the added structures of in rate, pirata, piscis but students very quickly pick up these terms. While there are a number of ways to do a movie talk, I have found for this one, the best way to engage students is to give students a blank piece of paper divided into three sections. Then describe the first part of the movie - to the point where Mors iacit aurum in aquam. Pause here and ask students to draw what you described. Describe the second part of the movie, ask students to draw again and then explain the end and again ask them to draw. After you have described the plot THEN show the movie. The point here is for students to see if what they understood matches the film. Next up is a short film that could be used with ​Manus Simii. It is called "The Wishgranter" and the verb optare will get a great deal of use in this talk as it does in the story. Lastly, for Tunica Rubra, a short film called "The Plunge" might be useful. Anulus figures heavily in this film. Note: A teacher's edition of reproducible material will also be published eventually (still working on it). In the Omnia folder is a new folder for Tres Fabulae Horrificae which contains a list of the words used by story and a count of how many times the word is used in each story. There is also a list of the 85 words that are used in all three stories as well. It is important that the student reading these stories know most of the words before they begin. In many instances, the graphic content will provide enough contextual clues particularly for unknown verbs and nouns that students will be able to comprehend the meaning without looking up the words. However, if there are simply too many unknown words, the students will lose the flow of the action. They can of course look the words up on the back but too much of this slows the reading down to a crawl and the story ceases to be compelling. I would suggest that you use these word lists to create your own word list to pre-teach the vocabulary before students read the stories. Below is a list of activities from the site that can be used to teach words or phrases in the story before students begin reading. Note; These activities teach individual words. The best words to use with these activities are words new to your students that are in heavy rotation in the story. These activities are in order of things to do first - when students just learned the words to last when they have some familiarity with them. It is not necessary that you do all of them - pick a few that appeal to you and your students and move on to Stage II. Clicking on these activities should open up the blog page where the activity is described in a new window. The next step is to fold the new words into phrases that use other words that you have used before - folding the unfamiliar with the familiar while continuing to review words you may have used in a previous unit but did not get much repetition. This a good place to fold in adverbs which are difficult for students to identify as stand alone words but are more easily remembered in a phrase. The following activities can be used to accomplish this. These activities can be used in any order. Each story is illustrated by a different artist with their own distinctive style. ​Below is the first page Necare Mortem. This is the simplest story of the three. It was an immediate hit with my students. Illustrated by Robert Rath. The man knows his Middle Ages.. Finally, Tunica Rubra - the longest and most grammatically complex but still highly readable for a student in Latin II. Illustrated by Carlos Montenegro. I love ghost stories..
All three stories were written in part to give students practice seeing multiple verb tenses. The plot of the stories requires characters to discuss what happened, what is happening, and what will happen. In Manus Simii, the characters also discuss what MUST happen as well. (Passive periphrastic is explained in the introduction.) Different verb tenses occur naturally and frequently in all three stories. I had been frustrated that textbook stories attempting to introduce different verb tenses too often result in the tense being used in an artificial manner. The imperfect tense is the best example of this phenomenon. To introduce the tense, many textbooks have several stories that are primarily told in the imperfect tense My experience has been that students reading these stories tend to flip to the perfect tense because they sense that even though the sentence reads "the farmer was carrying the grain," it sounds better if the farmer carried the grain." The future tense gets even less rotation. After one chapter where the future tense is the focus, it drops out almost completely. I felt students would have a greater grasp of verb tenses if they had a compelling story where multiple tenses were an inherent part of the story rather than artificially imposed on the story. Therefore, before reading these stories, students should be familiar with the present, imperfect, future, and perfect indicative tenses as well as the imperative mood. Knowledge of passive forms is not necessary. However, if your students have difficulty determining the difficulty determining the tense in isolation - in other words - can't remember the difference between necabam, necavi and necabo, I think you will be surprised by the degree of fluidity with which they will be able to read multiple tenses. Context with graphic support of the action helps a great deal. To review verb tense, use the verbs in the story in a phrase or with an adverb that helps students to identify the tense. These words may be: cras, mox, subito, iterum, postridie, subito, heri, numquam etc. there are many such adverbs in the vocabulary lists in the Google drive. The following activities can be used to construct short phrases that have different verb tenses prior to reading the story. The teacher's guide will contain reproducible material that will give students practice with this concept as well if you prefer not to write your own. The other common denominator here is practice with pronouns. There are many - I/me, you, we/us and you all. Dative and accusative cases are used the most frequently. In addition, both hic and ille are used regularly both to mean "this" and "that" respectively but also to mean "he, she and it." Iste is used a couple of times in Manus Simii and Tunica Rubra with the negative connotation seen in Cicero. At the end of reading all three stories, students should have a thorough grasp on pronouns. Again, context and graphic support will help students navigate the meaning but they should be exposed to these words ahead of time. All of the above activities can be used to help students practice pronouns. Again, short phrases here are key. It is less useful to have students identify mihi as "Dative indirect object" as it is for them to know that Narra mihi means "Tell me!" Although I have been writing stories in Latin for many years, the most successful stories have always been the ones that feature zombies, ghosts or are otherwise spooky. I had of course noticed that if students were interested in reading a story, there would be less whining, more cooperation and generally more peace and happiness in my classroom. However, several years ago, I had a powerful lesson in just how great that difference could be when I wrote an early draft of Necare Mortem. This story, based upon Geoffrey Chaucer's "The Pardoner's Tale", was twice as long as our textbook chapter and contained more complicated grammar. I figured that it might take almost twice as long for the class to read as the chapter. Instead it took half the amount of time. Some students stayed in class after the bell had rung to finish the story because they WANTED to know what happened. And that's not all - after the story, students naturally retained more of the vocabulary without added review. MeHercule! I thought - I need to see this again. About a month later, I wrote Manus Simii, based upon W.W. Jacob's short story, The Monkey's Paw. It's a great creepy story. As an English teacher, I had read it for years with reluctant readers and it was always a hit. This time however, it was a definite fail. Fail in fact is an understatement - it crashed, burned and left smoking ruins in its wake. I was flummoxed. What happened? Several surveys and discussions with students later, I discovered the reason was not the story itself, which they wanted to discuss after we had slogged through it but too much unfamiliar vocabulary. I had crossed that line where reading slowly becomes translating. Students were spending too much time looking up every other word in one of several glossaries - the word list, the back of the textbook, or the bottom of the page to enjoy the story. Scouring through the text, I realized that I had WAY too many unfamiliar words. Not only that, there were too many words that were simply used once. A great many of these words were used to establish the atmosphere and setting which are essential for a ghost story. How could I reduce the word count without compromising the story? I discovered that if I wrote this story as a graphic novella or comic, I could lose most of the problematic words since they would be represented by pictures. It was at this point, that I embarked on the project to create a graphic novella of three spooky stories. Necare Mortem seemed an obvious choice for the first, then Manus Simii and I borrowed the frame of a Swedish folktale for the third which became Tunica Rubra. Ecce - a mere two years later... the project is done. Three stories in Latin of ghosts, ghouls and grisly deeds for the intermediate reader. Here's a short promo of each story with panel from the graphic novella.